While "plastic master" is kind of an awkward term, it conveys well the function of a prototype such as this one. Those plastic slabs you see pictured beside this Barada first shot would have served to indicate what types of plastic different body parts were to be "shot" in once full production began. As you've probably figured out by now, the yellow slab refers to the torso, while the red refers to the legs (the red you see on the bandanna would have been painted, as the head was shot in a green color). The "ABS" typed onto the white tag on the yellow slab indicates the type of plastic used for the application, while the "Pant 459u" is short for "pantone 459u," the Pantone scale being a color reference system commonly used by designers. 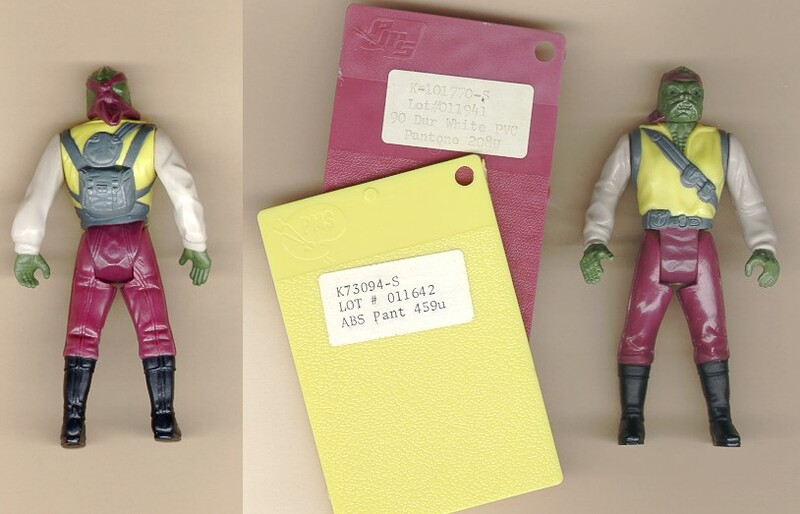 In many ways, these "plastic master" figures are analogous to the prototypes known as "paint masters," only paint masters come with plastic swatches meant to indicate painted rather than injected-molded color.